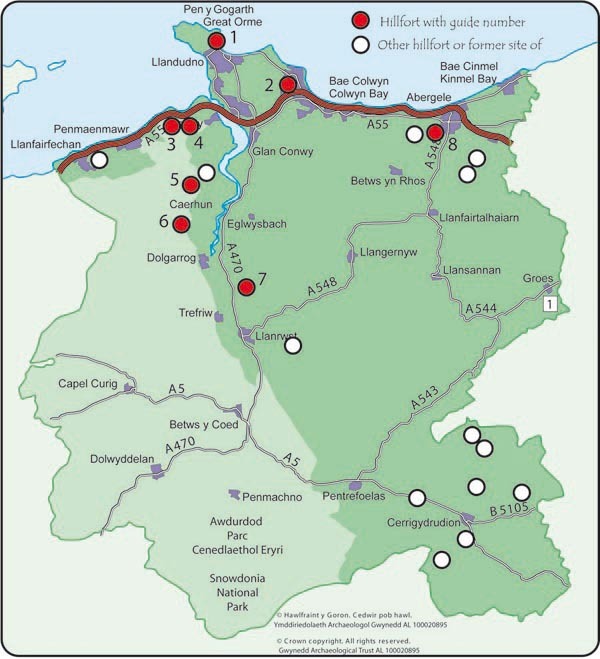 These pages are designed as brief guides to allow informed visits to a selection of hillforts in the County Borough of Conwy. The selection comprises the best preserved or accessible hillforts and includes a variety of different styles of fort. Brief directions are included but not location maps and the guides assume the use of an accompanying Ordnance Survey map, preferably the OS Explorer map OL18, 1:25,000 scale (2cm = 1km). Grid references are given to allow search for internet mapping. Acknowledgements: The introduction is based on work produced by GAT as part of a publication about hillforts in Wales being produced by Cadw. The guide itself was also produced as a project for Cadw. Most of the simplified plans of forts are based on those produced by the Royal Commission on Ancient and Historic Monuments in Wales (RCAHMW) as part of the Inventory of Ancient Monuments in Caernarvonshire, Vol. 1, 1956. That of Pen-y-dinas, Great Orme is based on a new survey carried out by GAT in 1993. That of Conwy Mountain hillfort is based on the survey carried out as part of excavations there in 1951 (Griffiths and Hogg 1956). The plan of Castell Cawr, Abergele is based on a new survey carried out by Engineering Archaeological Services Ltd, Blaenau Ffestiniog in 2002 for The Woodland Trust. The illustration of Conwy Mountain is by Helen Flook. All other photographs and drawings, GAT.